The purpose of my foray into Muscular Christianity has been to find some guidance on how to approach Men’s Ministry. In light of the challenge of getting men more involved in the church can we present the Gospel differently? Can we have programs and ministries focused on men? Can we do something outside of the church? Perhaps a more important question: should we do these things? First off. What good did the movement do? Here we are, a century later, still asking the same questions, struggling with the same issue that Muscular Christianity was supposed solve. So, it didn’t turn the tide. This is a warning that it’s probably over ambitious to think we can reverse the long-standing lack of greater involvement of men in the church. But that doesn’t mean we don’t try. Our goal in the church is not really to shift history but to save the individual man and to build up the existing church, namely our own. So we try, so that someone may be saved. The history of the Muscular Christianity movement reveals some dangers to be aware of when we try to develop ministries specifically for men. Let’s take a look at two big ones. Behind the idea of Men’s Ministry is the assumption that there is something homogeneous about men, a certain ideal manliness that we can hold up as God’s call to the Christian man. What is it that we want to make men into? What behaviors do we want to see the men in our church stop and what to begin? The danger here is that we begin to press men into a certain mold that may or may not be God’s mold for them. Muscular Christianity sought to engage men in the church again, to turn back what it saw as a tide of feminizing. 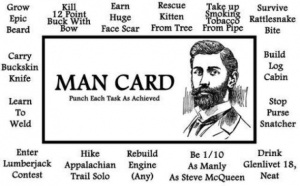 But in doing so, it defined manliness in a way that seems limited and selective. It held up the ideal man as physically strong and in shape, athletic, and primitive (which had mainly to do with being able to survive in the woods; this was part of the impetus for the Boy Scouts, and the Christian Camp movement among others). Being “civilized” was not manly. While being well-rounded was desirable, it seems if you were talented academically in college, but not on the football team, you were not manly. And if you were a pastor, who wasn’t also a baseball player or boxer, or someone, like Billy Sunday, with a muscular physique, then you also were not manly. If you had to choose one or the other, being strong in mind or body, real men chose the body. This may be a bit interpretive, but in rejecting “Manichaeism” and asceticism because those ideas devalued the body, Muscular Christianity swung too far to the other side, exalting the body and devaluing the mind and the spirit. It also incorporated a very black and white view of the world. If you weren’t manly, then you were part of the feminizing of the church. So, Lesson #1 is: Before we develop ministries for men, we best take a close look at our assumptions about manliness. What does it mean to be a man, not in our society, but according to God? If we do not define that, we will aim at whatever our culture says, or we will react against it. And we may wind up advocating something against God’s will. One consistent part of “manliness” as many define it, including me, seems to be a focus on the right use of a man’s strength. Men are generally physically stronger than women, and of course, through much of history, have held greater authority and power. A good part of men’s ministry focuses on the right use of that power. But by its very nature power is a difficult thing to channel and control. Power can quickly be used to justify anything and can be easily redefined. Early on in Muscular Christianity much was made of the power and strength of men as a means to evangelize the world. It was the great century of western missions, and if the Christian Church was to send missionaries to remote countries, it needed strong, vigorous men to do it. That was why you needed to get in shape, for the cause of spreading the Gospel. But it is interesting how that noble purpose morphed in time to the need to be stronger than other races, to dominate others. It is also interesting to see how the emphasis on sports as a means to become stronger so that you may fulfill Gods purposes didn’t take long to change into an exaltation of sport for sport’s sake. Far from holding up the missionary as the model of a man, the ideal of manhood became the professional athlete, someone who participates in sport for no other reason than to play, be paid, and entertain others. Sound familiar? The nobility of manhood soon declined as power’s sights were lowered. Man himself became the idol that worked for himself and no longer for his god. So here is Lesson #2: Strength and power are ultimately self-serving, and, far from being something that builds up the community, left to their own devices, they become a way to exalt the self against all others. Men’s Ministry needs to change the way men view strength and power. This is not to deny that men possess strength and power, but how can we succeed where Muscular Christianity failed? An emphasis on being a good father or husband, to take charge at home, can easily be used to dominate those who are weaker, like a man’s wife and children. It can also be very easily co opted into the superhero/Lone Ranger mentality of men. “I am strong and powerful. I need no one else. And God has called me to save the world,” is a script we men are prone to. We need to somehow not deny the strength and power of a man, but instead to redefine it according to the Scriptural call to love, which means to do good, to serve others, all others, especially those most in need. But to take this a little further, in Lesson #3, it is perhaps wiser, and more in accord with the Gospel, to not speak of strength and power at all, to not focus on them, but rather speak only of the call to serve and to love as Jesus served and loved us. 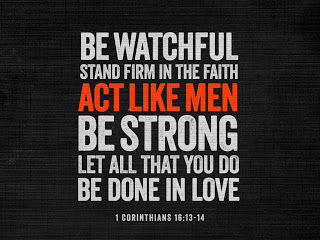 If men do this with their whole heart, they will naturally use their strength and power to accomplish them. But to dwell on one’s strength and power leads inevitably to an over-focusing on those, which inevitably leads to misuse. Strength and power are a man’s means to achieve God’s purposes, not the ends. A knowledge of history here allows us to get a sense of the pitfalls and possibilities of a ministry. We can see the whole run of Muscular Christianity, and can see how it changed over time and how it connected with the events of the time. It allows us to chart our path with greater awareness of how easily such movements can be hijacked by other goals and fears, and derailed by events around us. There are no doubt other “men’s movements” in history that would be instructive. We could investigate monasticism, some of the different approaches to ministry found in Roman Catholic orders as different as the gentle, loving Franciscans and the militant Jesuits, and more. But this is a blog, not a book. And I suspect these observations would hold after reflecting on these other examples. 1) What is it that we want men to become? Or what does it mean to be manly? 2) How will we call men to acts of love and service employing their strength and power without becoming too focused on that strength and power? 3) How will we connect men to a community of faith and to the wider fellowship beyond fellow men, a fellowship that includes those who men may be tempted to view as “weaker”? Note: There was, in the U.S., a Muscular Christian movement among the African-American Church and the Roman Catholic Church, which was largely immigrant, and among Jewish Americans. I limited my consideration to the much larger and socially dominant Anglo-Saxon Protestant movement, although it seems that Muscular Christianity went in different directions among the other ethnic and religious groups. This entry was posted in Regular Posts and tagged Christianity, Church History, Men, Men's Ministry, ministry, Muscular Christianity on August 7, 2014 by revkamcclain.